Keywords: Burnout, resident, Patient, Healthcare, Questionnaire, Copenhagen Burnout Inventory. Objective: To determine the burnout among postgraduate residents’ and junior consultants in a tertiary care hospital. 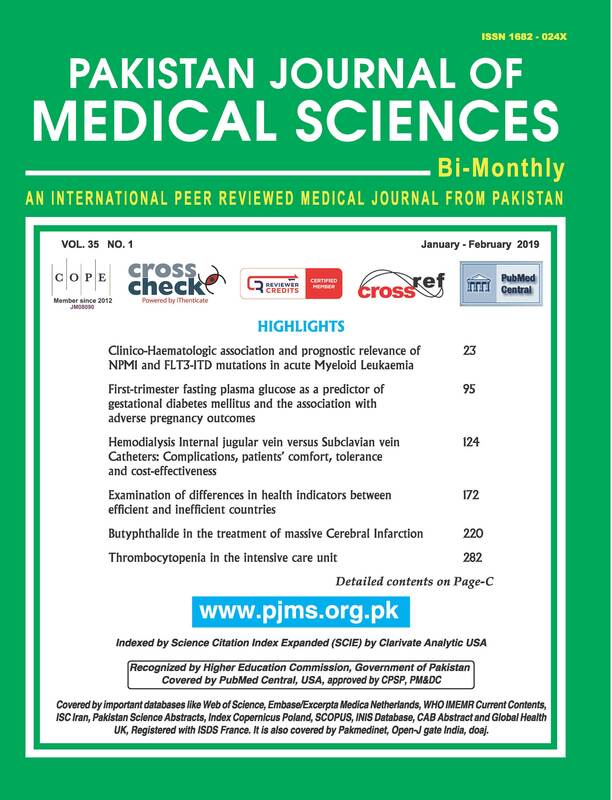 Methods: This cross-sectional study was conducted among the postgraduate residents (PGR) and junior consultants (JC) working at The Children’s Hospital Lahore in 2018. Participants were asked to complete Copenhagen Burnout Inventory questionnaire about burnout on 5 point Likert scale. ‘100 (always), 75 (often), 50 (sometimes), 25 (seldom) and 0 (never/almost never or according to intensity ranging from ‘a very low degree’ to ‘to a very high degree’. Data was analyzed using SPSS version 22. Three questions were added related to hospital factors but scored separately. Students t-test and chi square test were used to compare the burnout. Results: A total of 227 participants including 177 PGR and 50 JC completed the questionnaire with a response rate of 84% and 86% respectively. There was a female predominance, 140 participants (61.7%) were female. Majority was from pediatric medicine 173 (76.2%). The mean personal and work related-burnout was high among PGRs as compared to JCs (18.68±5.01 vs 16.62±4.57) (p=0.008) and (21.14±5.57 vs. 18.56±5.52) (p=0.004) respectively. Similarly, there was significantly more burnout among pediatric medicine study participants as compared to surgery and diagnostic in all domains (personal BO; p=0.030, work-related BO; p=0.021, patient related BO; 0.033 and hospital related BO; 0.001). No difference was noted based on gender and year of training. Conclusion: Tertiary care hospital postgraduate residents and junior consultants face moderate burnout. Postgraduate residents had significantly more burnout as compared to junior consultants and majority were from pediatric medicine.